Yesterday was Father’s Day, but not all fathers are the same. ELISA VORSTER talked to three fathers with different ways of doing things. Father’s Day has become pretty important in our family over the past few years. My husband celebrates fatherhood with epic drawings from our two children and does the things they enjoy together – watching movies and wrestling on the trampoline, leaving the kids in fits of giggles. 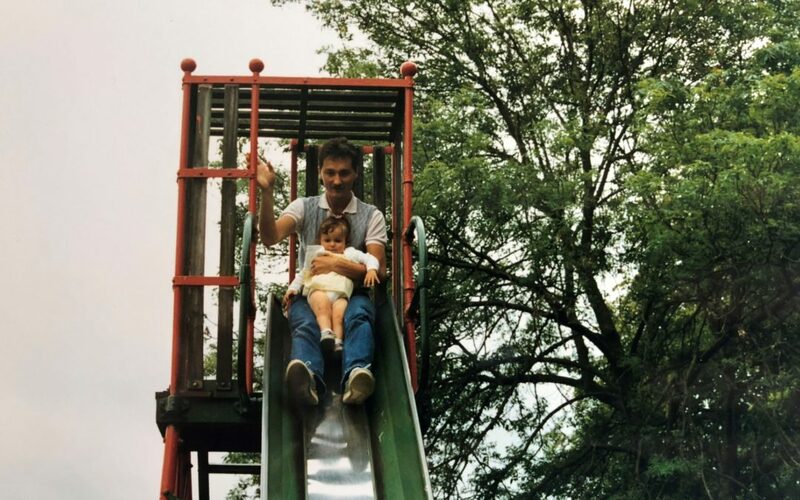 I also treasure the time with my own dad, as you tend to do as you get older. As a child, I always thought my dad was cooler than other dads. He always ran around and played with us, and his sense of humour was never lacking. My favourite teddy bear probably didn’t feel the same, as Dad used to hide him in some pretty tight spaces, leaving him slightly deformed. Nowadays, I still think my dad is cooler than other dads. I get to watch him do all the same things with my children, and we get to laugh hysterically as his ‘dad’ jokes seem to get worse each day. But I’ve also come to realise that every person’s dad is cooler than others, because every dad is special, and no two dads are the same. 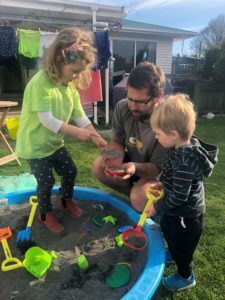 Stay-at-home dad Matt Head playing in the sand pit with daughter Lydia and son Thompson. 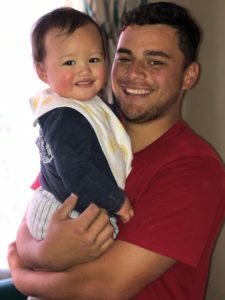 Five months ago, Matt Head and his wife, Kate, decided to escape the hectic city life to spend more time with their two children, 18-month-old Thompson and three-year-old Lydia. Part of their new laidback Carterton lifestyle means trying to give the children less time away from them. When Kate secured a teaching position at Gladstone School, Matt was “gobsmacked” as he realised he had just been appointed stay-at-home dad. “I wasn’t sure if I was ready for it,” he said. But he’s now treasuring his new role, showing other dads it wasn’t just a gig for mums and the prime minister’s partner. Daily activities included splashing in puddles, watching trains go by, and throwing stones in the river. He said, while it could be tough, he realised fatherhood was a privilege as you never knew how much time you have left with your children. He laughed as he admitted he has learnt how to cook and was in the good books this week for getting the house looking immaculate. For Father’s Day he had one simple request. Isaac Walker with his son, Hezekiah. At 19 years old, Isaac Walker has more responsibilities than most teenagers would dream of. Despite this, he is all smiles as he talks about what he loves about being a dad to 14-month-old Hezekiah. “I just try to talk to him, because he’s funny – he thinks he’s clever,” he said. Walker said his son loves to point at things and ask “what’s that?” and responds as other family members call out “pakipaki” or “clap clap”. Although fatherhood was a huge learning curve, Walker said it has been made easier by the help and support from family. Now Walker has really embraced the role of caring for his family. He is working fulltime in the building trade while his partner Teina Kerehi continues her studies at the Makoura College Teen Parent Unit. He said the main thing he wanted to teach his son was to always “be good to his mum”. And he only had one wish this Father’s Day – to “chill out and play” with his son. Stuart de Lara-Bell knows the value of a good father-son relationship. For 23 years, he worked with his father Paul and brother Daniel running the family-owned supermarket. His own son, eight-year-old Seth, was a bit reluctant for his grandad to sell the family business as he loved seeing his dad and grandad there. But he knew his dad’s new job as an apprentice plumber was a good job too. “I like it, he’s happy,” Seth said. And de Lara-Bell certainly seemed happy as he cooked dinner, under Seth’s watchful eye, for him and his five-year-old sister Tayla, giving his wife, Aleisha de Lara-Bell a chance to go to the gym. 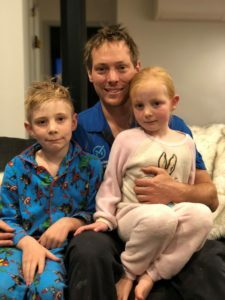 He said it was important for his kids to see him happy and healthy, which gave him the energy to do all their favourite things together – play football, do workouts in the garage and play board games. He said Father’s Day carried with it a special family tradition of playing a round of golf – something made extra special as there were now four generations of de Lara-Bell’s taking part.